This has seemingly all gone to his head and he’s now prancing on our walks. Be forewarned: I have put more thought into sewing these two pieces than I have in any other garment recently. It’s… troubling. First up is this V-neck sweater is from Simplicity 2755. 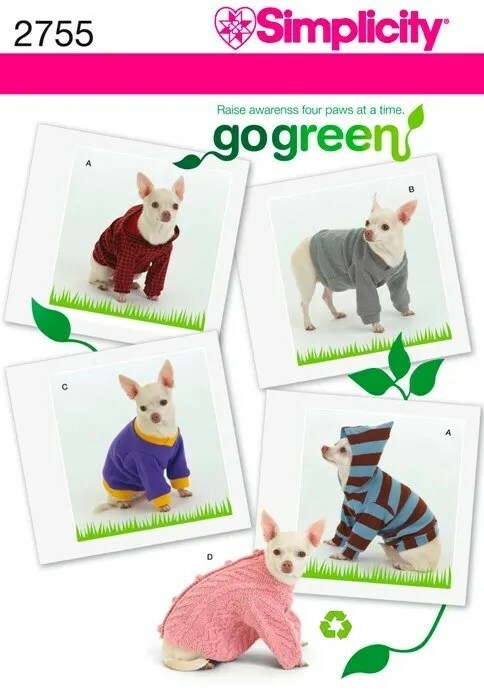 It’s part of Simplicity’s ‘Go Green’ line and also has a little hoodie pattern included. Cuuuuuttttte. I’m gathering from this experience that Go Green is designed for beginners, occasional sewers and crafters. The pattern is not fitted, kind of oversized and designed for single layer cut out. While I like the V-neck feature (my own v-necks don’t look this good!) the pattern is not drafted for pee clearance. 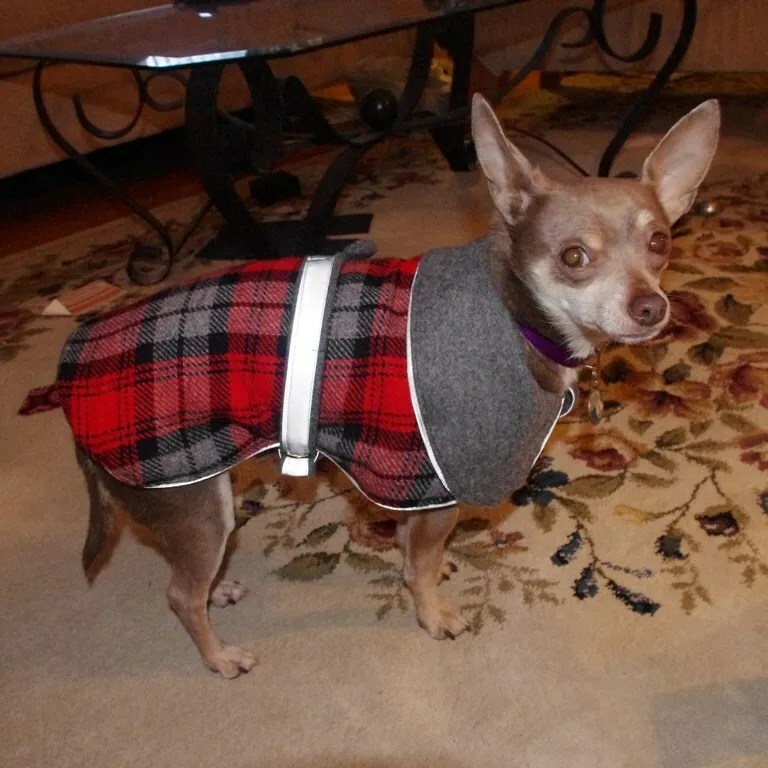 I think it’s a colossal PITA to take a sweater off the dog to put on a coat when it’s time for a winter walk. So, I think I’ll tweak this 2755 to be similar to the bottom draft of Simplicity 3939 that I’ve made for Linus before. 3939 also has a snugger fit that he can’t wiggle out of in his sleep. For once, I actually measured Linus and he fell in the ‘small’ for his chest and weight but the length of a ‘medium’. So, I added one inch in length (I’ve noticed things I buy for him in his weight and chest tend not to be long enough). But… Liz says Linus looks like he’s wearing a kimono (print, color blocking). So, I may just sew the XS next time. Above is the original crazy-long non-pee clearance length. I try hard to keep little Linus looking as butch as possible. We both have our pride. But, the dress-length sweater in a swirly print wasn’t helping. I tried to adjust by hacking three inches off the bottom and rolling up the sleeves. But, shortening the pattern still didn’t give him clearance. Comparing Simplicity 3939, I see that they are drafted with a different slope around the dog boy bits. Only one review on PR noted the pee clearance issue. But, I read the review after I sewed this up. Doh. Here, shortened with a black instead of self fabric band. The pattern only takes 5/8 a yard and is cut single layer to conserve material. I used a warm wool sweater knit from Mood Fabrics leftover from a soon-to-be posted cardigan. So, it’s a pattern with good features. But, for my needs will need some tweaking. Reecntly, I was asked to consider a new cape for Linus by a frequent male walker. He said he was walking Linus and realized that when he was wearing his gray winter coat and Linus had on his cape — they looked like they were dressed alike. And other people on the walks had noticed too….I think it’s hard enough to get a grown man to walk a twee dog that isn’t even his. So, why add insult to injury. With this in mind, I revisited Burda Magazine’s Sherlock Holmes’ inspired dog cape. I like the first one I made for Linus, but wanted to try a few new things. This fabric is a remnant of a beloved project. My aptly title ‘Sherlock Holmes Dress’ from 2008 (man, I really needed an FBA). First, I piped the whole thing in a reflective piping. This stiff plasticy piping I bought in NYC a few years ago. I think I was planning a messenger bag for biking. The plastic is too stiff for the body of the cape. But, awesome in the collar. I think I’ll just stick with piping the collar in the future. It’s really hard to see the piping along the body. Second, I used two D-rings for the ‘belt’ (which is also waaay too long). Kind of fussy. I think I’ll just use strips of velcro in the future. Third, I went back to the original length. 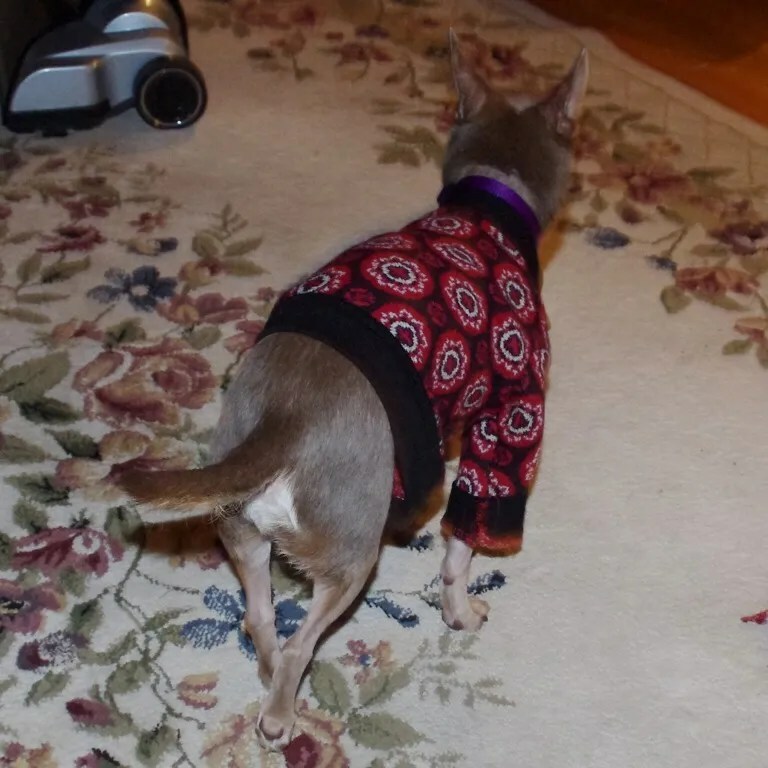 I shortened the pattern the first time, but decided it was a little too short for him (again, he’s longer than a typical Chihuahua). I do think it’s a little big at the neckline still, so I’ll adjust for that next time. Oh, I also cut the underlining a bit smaller. It seems to help with having the cape ‘curve’ toward Linus and not stick up when he… squats. I have a few more patterns I’d like to try out for him this year. But, I’m good for a little bit. I’m all dog sewed out. Linus looks so dapper in his new cape. My dog freaks out when I undo the velcro on her coat, I’m looking for an easy alternative. Love the dapper dog. I resently made a rain cape for my lab. 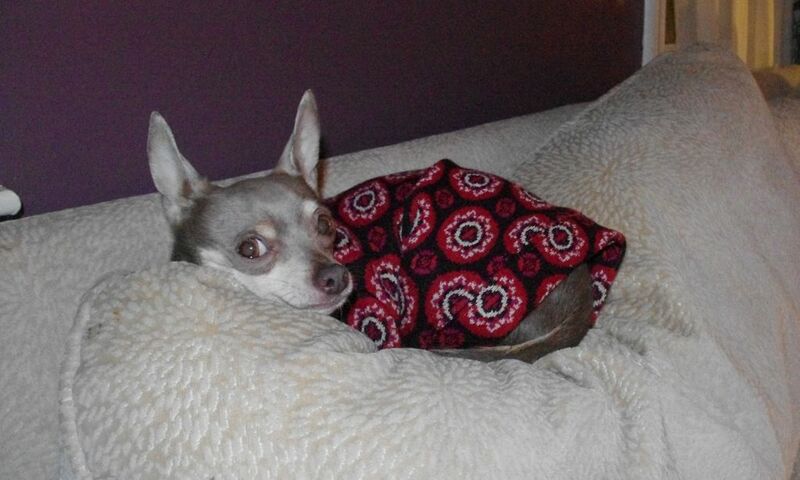 It is a lot harder to find a pattern for a larger dog and she just don’t have that cute factor that Linus does. The cape does help in the rain and keeps her warm and dry. Love the reflective piping. Great job. Oh my gah, the Sherlock Holmes cape is SO FREAKIN’ CUTE. What a little guy! Linus is fab! He carries off both the Advanced Style and the Sartorialist looks. Thanks to the reference to the pee-clearance-less patterns. 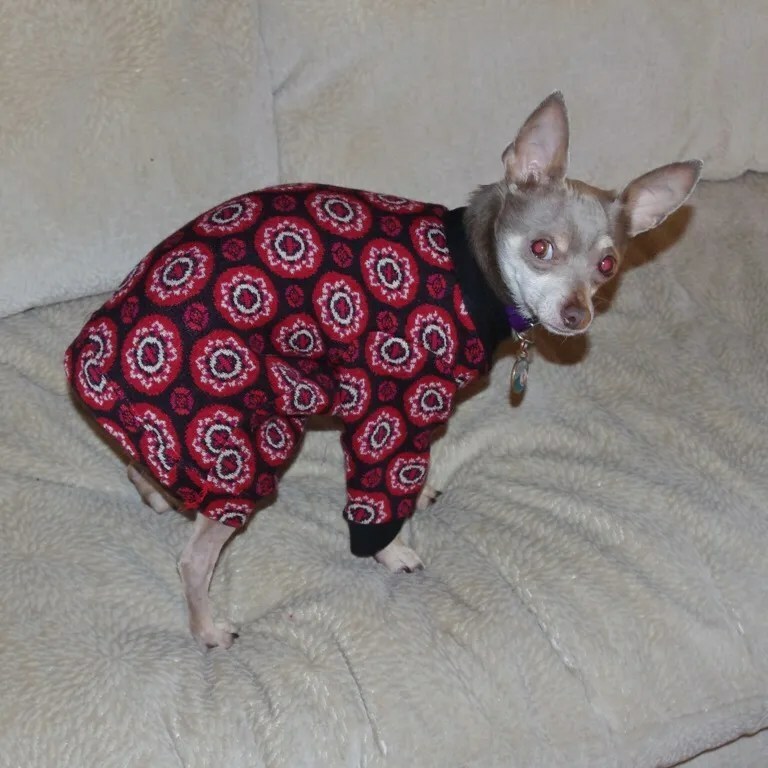 I have girl dogs so I seek out patterns that properly cover the belly. We get cold here in Montreal. I loved that your dog walker asked you to consider a new cape! Very funny! Thanks. Fun. Sir Linus looks very dapper in his new cape. Linus is just too handsome in his wardrobe! 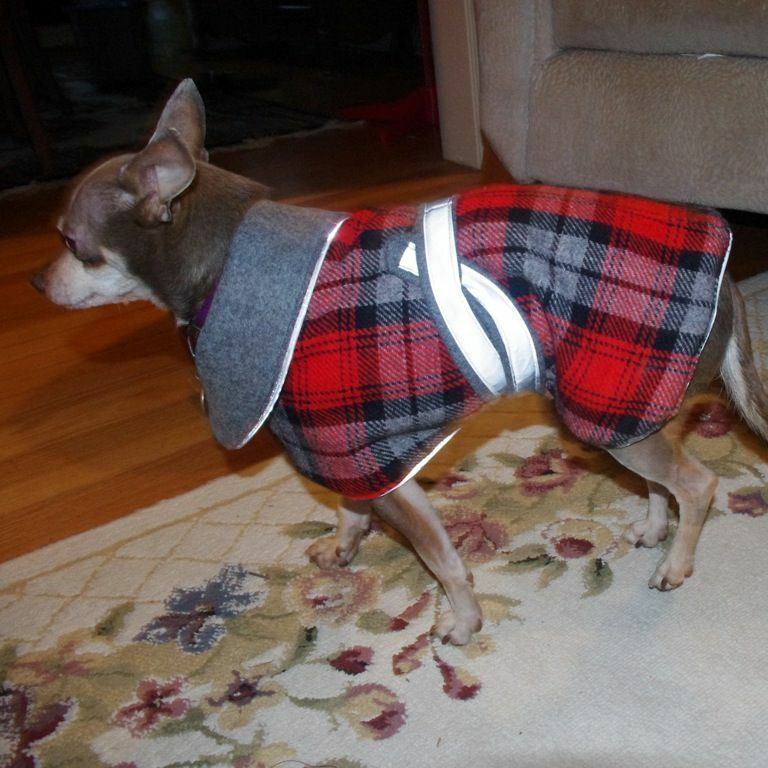 Love that your dog walker was embarrased by the twinsies coats. I can’t imagine why… But, love that now you and Linus have matching sweaters! I’m jealous of all the patterns available for little dogs but my newfoundland is probably so glad I can’t dress her up everyday. Halloween was bad enough! The sherlock cape is awesome. I have a girl and a boy dog, and although they are close to the same size for coat-making, I always have to remember the pee clearance issue for the boy. Coats are okay, since I just make sure the belt is out of pee range, but with sweaters, I haven’t come up with a good solution. I just have to make it short and then he runs around with his booty getting chilled. Haven’t had much luck with hoods, either, since both dogs have those huge, stick-up ears. That dog get sssoooo much love. I’m even jealous. He looks a bit like Hugh Hefner in his little maroon sweater… 😛 I love the little Sherlock Holmes style cape, too cute!! 🙂 I’d do either clips like these (http://www.etsy.com/listing/118034044/tiny-516-swivel-bolt-hooks-4-pcs-antique) or a snap instead of velcro, just in case the noise scares him. I laughed so hard reading this I almost choked on my lunch! I’m a lurker coming out to say that you have a fun blog and a definite way with words. Thanks so much. I’m also a former Baltimorean who enjoys glimpses of my home town. Love the Sherlock cape! I have a mini poodle that requires outdoor wear, too. 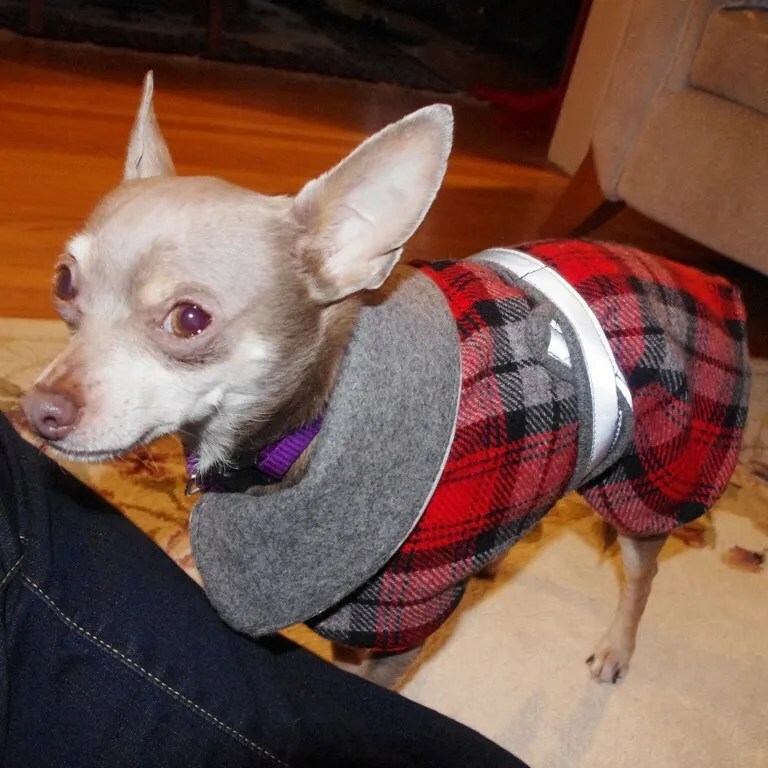 I’ve not made anything for him – although I probably should – and my eldest daughter loves to dress the poor guy in a purple plaid faux-shearling trimmed hoodie, complete with backside pouch pocket for his doggy bags. 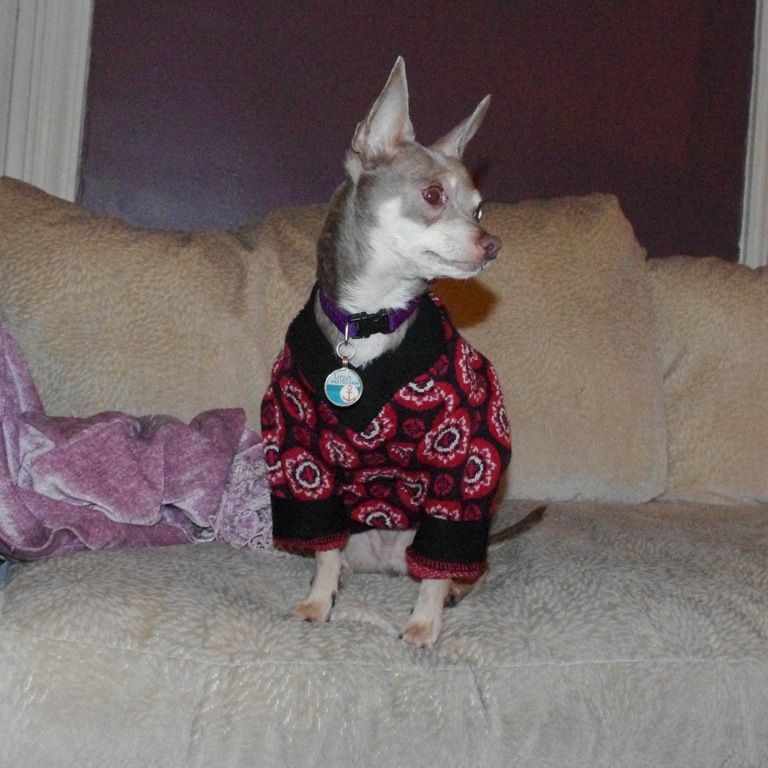 I have a chihuahua too and he gets excited when I get out his coat-walking time! I love what you’ve sewn for Linus, I’ll have to pick this pattern up for Cujo. Love, love, love reading your blog Celie! What an amusing post, Sir Linus is adorable in all of his wardrobe. So many cute dog outfits! I love that you and Linus now have matching sweaters. The Sherlock Holmes cape is very nice indeed. I like the use of reflective material! Linus is so handsome! My dogs have handmade hoodies that they wear on walks. SO CUTE! My dogs are chihuahua mixes that are also between sizes. If I buy them clothes, in order for the clothes to fit their chests, I always have to shorten–especially shorten the pee-zone. So Linus is not alone in that adjustment. So cute. I know the ‘pee’ factor is important – but animals lose more body heat from their underside than they do from their backs, so it is important to have the chest and stomach area kept warm. Maybe a wool sock to hold close to the body underneath the cool coat? Linus is so Handsome in his cape and sweater! 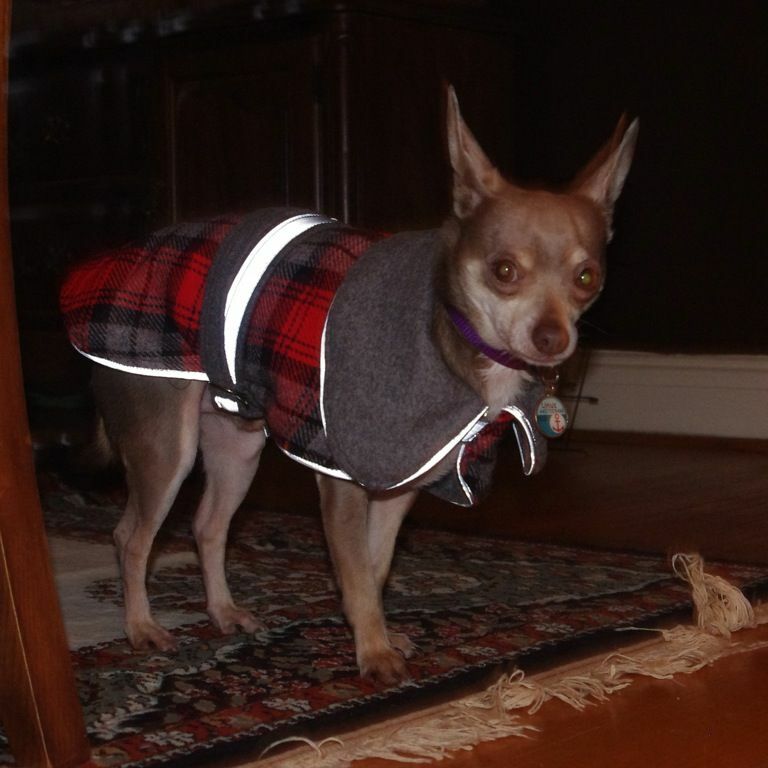 My dogs hated their coats, but he is a stylish guy. Linus knows he’s “Da Bomb”, no joke! But he comes by it honestly….consider his Mom!!!! Mister Linus is too cute for his own damn good, you know that? Problem is, I think HE knows it, too. Both of those outfits are adorable, but the Sherlock cape is beyond cool. Love them! Sir Linus deserves bespoke clothing, sewn by someone who understands his needs. It is his due. What a stylish pup! He is better dressed than a lot of people I know! I’m afraid to sew anything for my Westies. They love coats, scarves, etc. and would want to wear it all the time. Only problem is, Westies are hot little dogs. Once I tried a sweater I had knitted for my son’s Pug on Chloe and I almost didn’t get it off her! Oh I love his statement coat! So much fun to see Linus stylin’ in his new duds! You did a great job of each. I especially like the cape. It’s a Linus Holmes look, for sure! I cannot lurk on your blog any longer after seeing how great Linus looks…as a basset/beagle mom I do not think it is weird at all to put a lot of thought into canine clothing. Love the sherlock coat- fashionable and functional. I’d never thought of the whole ‘pee clearance’ thing seeing as a have a girl dog. That could get messy! What is even better for attention-getting when walking your dog is to dress him in antlers at christmas time. Molly has antlers for christmas and devils horns for halloween and for Melbourne Cup Day last year she wore a red lace and feather fascinator. I want to come and cuddle Linus, he is too cute in those outfits. That dog be cute. Seriously. I tend to just talk to the dog and completely ignore the owner. Not sure which is better. I’ve heard that cats are chick-magnets for guys who have them, so maybe the opposite is true!? you know this falls into crazy cat lady category. 😉 and I would know…. Hahaha! I said I was troubled 🙂 But, he really is cold. Ans, they aren’t costumes. That’s the only line of drawn… not a costume. Oh my goodness, he is fancy! Love the cape, especially the reflective tape. Now he just needs a pipe to complete the look. Stylish pup, love the plaid, but I’m not seeing the bathroom clearance…. you’re right, you do get a lot of comments about a dog in clothing but I just can’t help add mine too – he’s so cute, especially the cape. You had me at puppy (I call all dogs puppy, because they’re all just so darn lovable), but I’m in love with the tartan and grey number. It suits the little fella’s colours 🙂 Gorgeous!